Center Mass, Inc. has an ingenious pouch for AR-15 magazines that attaches to your duty belt behind your pistol mag pouch. The Patrol Rifle Integrated Magazine Pouch ensures you always have an additional rifle mag with you, without the need for strapping anything else to your rifle. Let’s face it, mag couplers can get heavy when holding a rifle on a subject for a long period of time. The pouches that strap to the rifle’s buttstock can come loose, and they can get in the way if you transition between shoulders to work around corners and cover. The integrated mag pouch simply goes between your regular pistol magazine pouch and your belt, putting it where your hands have already trained to go for a reload. Hopefully, we will be getting some of these pouches to test in the near future. I want to see if the system works as well as it looks like it should. In case you have not heard it yet, check out my interview with Jeff Felts of Center Mass on episode #013 of the BlueSheepdog Podcast here. Jeff and I talk about his company’s products and the annual National Patrol Rifle Conference and Competition that he organizes. There is a two day training conference and vendor expo associated with the event, so it is something that you should consider getting involved in. 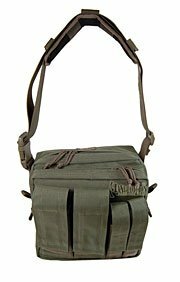 The new MAXPEDITION Active Shooter bag makes an excellent bail out bag for the patrol officer. The unpredictable nature of police work requires cops to carry a lot of equipment and paperwork in their cars. You never know what kind of calls you will get on your shift, so you have to bring everything you might need. Of course, you never know what you may need on any given call. That’s one of the reasons a police officer’s duty belt has more gear than Batman ever had on his belt. There are some calls that you know are going to require more than the average effort. Calls such as barricaded subjects and active shooters may pop up unexpectedly, but most of the responding officers will have the chance to grab an extra item with them when they get on scene: the bail out bag. What is the bail out bag? The bail out bag is a small to medium sized bag that an officer can stock with less commonly used items that may be of great benefit on calls that fall outside the officer’s routine workload. The Fenix L2D flashlight is a compact, tactical flashlight using LED technology to deliver a bright 175 lumen beam. I recently received a L2D flashlight to test, and I was very impressed by its performance. I carried the flashlight on-duty in the nylon holster that comes with the L2D. Additionally, I carried the Fenix flashlight in a cargo pocket of my shorts virtually every day while off-duty. I also passed the flashlight around to other members on my squad, and several of them used the light for their duty shift. All of us were impressed. The Streamlight Strion flashlight is a hand held, rechargeable flashlight that throws a lot of light considering its small size. I bought mine two years ago and have been very happy with its performance. When I bought the Strion, I really didn’t know if it would do what I wanted, so I took a risk. I hope that this article will give you a better understanding of what the Strion is, and what it isn’t, so you can make an informed decision regarding your flashlight purchase. 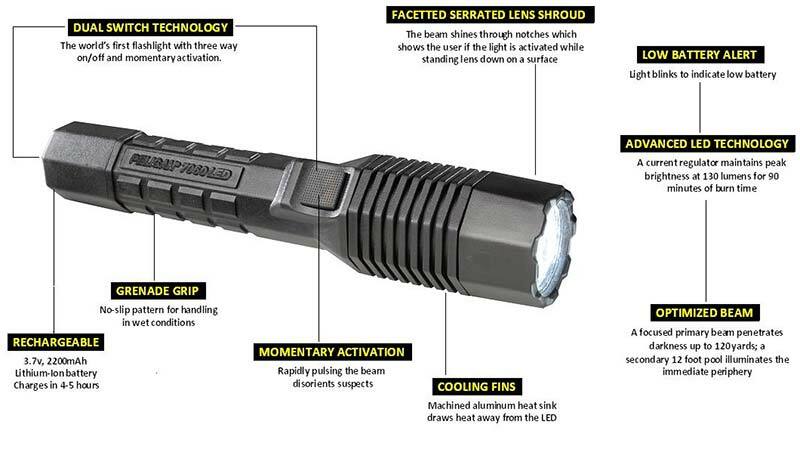 SureFire manufactures high-performance flashlights and tactical gear that helped revolutionize lighting tools and techniques in law enforcement. 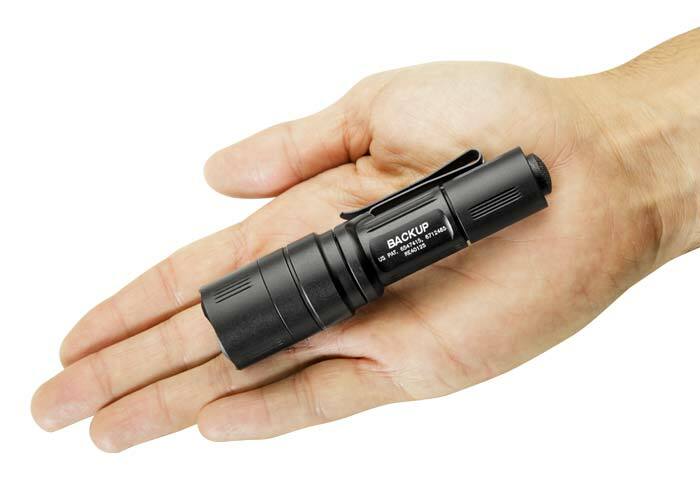 Following the company’s tradition of innovation, SureFire introduced the E1B Backup flashlight for officers in plainclothes assignments and off-duty carry. The E1B is very compact: only 4.4″ long and weighs a mere 3.3 ounces. The flashlight has a reversible clip so it can be carried in a pocket or on a belt with the bezel either up or down depending on your preference. SureFire also designed the E1B with a “melted styling,” meaning there are no knurling or rough edges to snag on clothing when you need it. Even though the Backup is very compact, it still is extremely powerful. Using a high performance LED, the E1B emits 300 lumens of blinding white light, for up to 1.3 hours on a single lithium 123A battery. 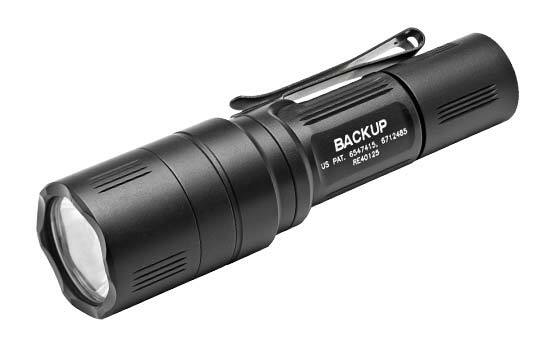 Additionally, the E1B flashlight has a secondary light mode of 5 lumens for more mundane tasks like maneuvering through your garage at night. Run time on the low power mode is an outstanding 40 hours. This is the current model of E1B. The original version of the light was also a LED powered light, but it was less efficient. The light output was a mere 80 lumens on high and the low output mode did not run as long. Clearly, the company is taking advantage of all of the modern LED ‘bulbs’ and microprocessor controls of battery output. There are a variety of good lights you can carry off duty, and this is definitely one of the better ones. I’ve used SureFire products in the past. While nothing is perfect, SureFire tends to make good quality stuff you can depend on. The Los Angeles Police Department to develop this light. While I have been told that the LAPD specs may have been politically motivated, the fact of the matter is Pelican developed what appears to be a darn good tactical light for police work. The 7060 advertises a brightness of 130 lumens, which is highly impressive. The ubiquitous identifying threats in low light or research on the mis-identification of threats in low light, you know how important it is to have a powerful light available to you. Another advantage of the Pelican 7060 flashlight is that it is rechargeable. Pelican states that the flashlight will recharge to full power in less than five hours. So, even officers that work 12-hour shifts need not worry about having enough time to fully charge their flashlight before returning to work. The 7060 also boasts a feature that I’ve not seen on many other flashlights: two switches. The 7060 has a tailcap switch and a side mounted switch. Both switches offer momentary on/off as well as a ‘normal’ on/off. I see this as a huge benefit. Different officers prefer different styles of using lighting while clearing buildings. Some styles of holding a flashlight lend themselves to the tailcap switch or the side switch, but not both. If a department was to issue these to the officers, each officer would have a tool that is flexible enough to use with their preferred method of deployment. Frankly, I don’t think the flashlight is pretty. 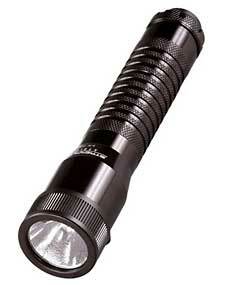 In fact, I think the Pelican 7060 LED flashlight is a bit ugly. That’s ok, though. My Glock 19 is pretty ugly too. But my Glock has never had a malfunction even though I have put more than 5000 rounds through it. Ugly is good. With the Pelican “You break it, we replace it… forever” warranty, I think that this tactical flashlight has an excellent chance of becoming one of the predominant tools in law enforcement.